This solution is the technical update of the SAP platform, which allows improvements in the system, both in the technical and functional levels, to achieve integration with other platforms and optimize business processes. Currently, businesses are either flexible or they disappear. In adaptating to the new ways of doing business, when we face new processes, new demands of the clients and suppliers, new requirements or functionalities of the information system arise. If there are no updates in SAP, there are no new functionalities. Moreover, maintenance contracts become more expensive to the point of having no support. Therefore, it is necessary for SAP to be continuously updated. 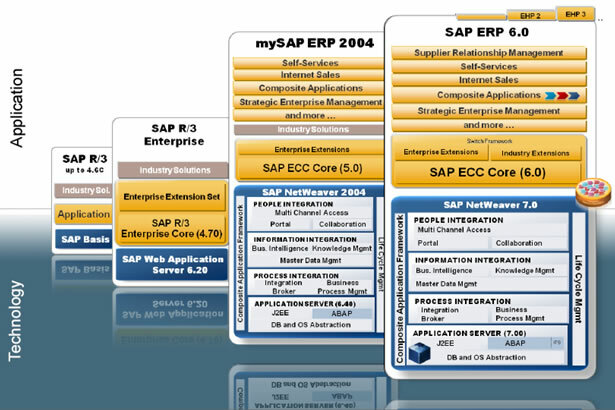 Evolution of the versions of SAP and its applications over time.